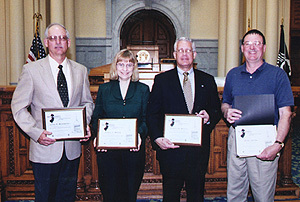 The New Jersey Department of Environmental Protection (DEP) , Historic Preservation Office and NJ Historic Sites Council presented awards recognizing the steadfast efforts of individuals, organizations and government agencies to preserve the State's valuable resources at the annual New Jersey Historic Preservation Awards Ceremony at the New Jersey State House Assembly Chambers, on May 1, 2004. Assistant Commissioner for Natural and Historic Resources and Deputy State Historic Preservation Officer John S. Watson, Jr. welcomed the recipients and guests, and read the Governor's Historic Preservation Week proclamation. 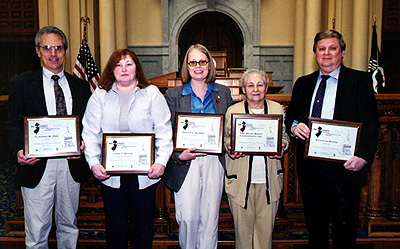 Historic Sites Council member Mark Mutter prsented the awards on behalf of the Council. "Close to Home... History in Our Own Backyard,"
The Metropolitan Inn of Burlington City was historically known as the Blue Anchor Tavern and is said to contain 250 years worth of history within its walls. Having stood vacant for over ten years, its colorful history and prominent location at the heart of Burlington’s historic district was targeted for transformation. There were three key goals in mind: the creation of affordable housing for low income seniors, the expansion of versatile retail space, and the preservation of the historic architecture. The façade was repaired in order to approximate the building’s exterior circa 1930. The main commercial entrance facing High Street was retained, with the fanlight transom above the doorway uncovered, and the pediment above replaced to its 1930s appearance. Code-compliant steps and a ramp were installed. On the interior, an ornate Victorian wood and marble bar (that survived an 1856 fire), a pressed tin ceiling, original window, door and wall trim were all restored. On the second floor, one of the apartments contains the vestiges of the “Presidential Suite,” whose historic marble fireplace, entrance vestibule, plaster crown molding, and elaborate window and door trim remain intact. Some of the circulation corridors highlight the existing corbelled brick cornices, which are also visible on the exterior walls facing the courtyard. The monumental staircase with ornamental balusters and railings remain in place, and an exterior wrought-iron balcony was refurbished. The Metropolitan Inn, managed by Pennrose Properties, Inc. now contains a total of sixteen one-bedroom, adaptable and handicapped units, as well as 8,000 square feet of retail space on the first floor. The building offers plenty of natural light, varied floor plans, historic significance, and easy access to downtown Burlington and the new River Line - coincidentally at the location of Burlington’s first railway stop. The entire project took 22 months and cost $1,388,060. Its transformation illustrated how preserving a community’s past can so effectively intertwine with creating its future. Recognition to the project team: Pennrose Properties, Inc., Developer; Kitchen & Associates, Architects; PWI Engineering; Michael A. Beach & Associates, Structural Engineer; Domus, Inc., General Contractor; Noble Preservation, Historic Preservation Consultant. The Straight Street Bridge is a six panel, Pennsylvania through-truss bridge on brownstone abutments which had been built for an earlier structure that washed away in 1903. The current bridge is a 225-foot single span and 30.7 feet wide bridge completed in 1907. This truss was originally designed for the Pennsylvania Railroad with the ability to support the heavy loads required for rail traffic. 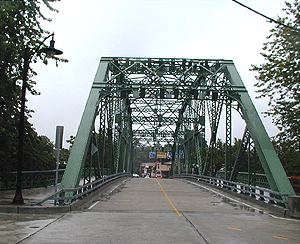 Such heavy trusses were seldom used on roads, but the industrial setting of Paterson dictated that a stronger bridge would be needed at that location. The rehabilitation was completed with almost no visible changes to the superstructure. All components below the bridge deck were replaced including the cantilevered sidewalks. To minimize visual changes NJDOT used round headed bolts as replacements for deteriorated rivets, a hollow steel rail barrier was used in place of standard guide rail to protect the trusses; and historic style light fixtures were installed. Deteriorated elements were replaced in kind, and the original sidewalk railing was sandblasted, painted and re-installed. The project took 20 months and cost $3.2 Million. The original plan for this structure was to replace it with a four lane, modern concrete bridge, but through the careful consideration and scrutiny that is mandated by federal transportation laws, it was realized that the rehabilitation alternative would be cost effective, logical and adequately address the project need. With this project, the Straight Street Bridge should be around for another 100 years. Saving this vestige of its past provides Paterson with a vital link to it’s history, at the location of the first planned industrial center in the newly formed United States. 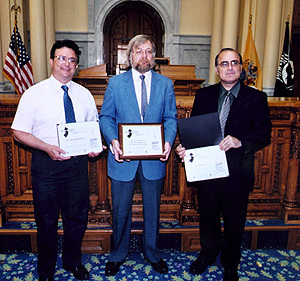 Recognition to the project team: NJ Department of Transportation: Shan Sundaram, Project Manager, David A. Zmoda, Principal Environmental Specialist, Shawn Rabban, Resident Engineer. 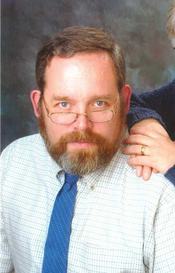 Parsons Engineering: David E. Hollod, Design Consultant. Colonnelli Brothers, Inc, General Contractor: Robert Campbell, Project Engineer. Passaic County: Passaic County Board of Chosen Freeholders, Steven Edmond, Passaic County Engineer. 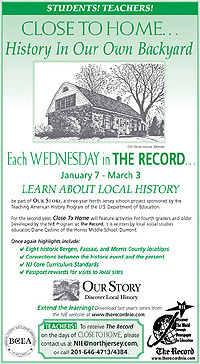 "Close to Home... History in Our Own Backyard"
Close to Home…History in Our Own Backyard is an initiative undertaken by the Bergen County Record to motivate students to not only learn about historic sites, but to visit them as well. During the months of January and February 2004, weekly activities were printed in the newspaper based on historical themes, associated with specific, accessible historic sites. The published activities were complimented by teacher in-service events to help educators incorporate local history in their lesson plans. 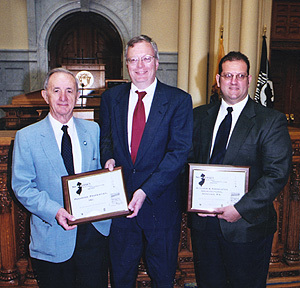 These were held at William Paterson University, The Record, the Stadium Club at Giants Stadium and the Bergen County Vocational-Technical School’s Campus in Hackensack. More than 150 teachers attended these sessions. After publication, the activities were made available on a web site. Each newspaper supplement included a “Passport to the Past” coupon. Students visiting five of the eight sites were able to redeem the “Passport” for a free gift by mailing it back to the Bergen Record. More than 21 schools returned these coupons. The sites were chosen based on their availability to the general public, and themes that would show the progression of history from Colonial times to the present. This program was made possible through a community grant from the Bergen County Education Association. 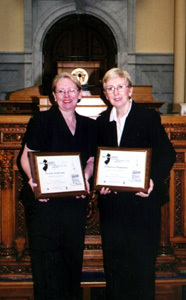 This series was created by Cynthia Forster, Manager of the Education Services at the Record, and a former teacher and secretary of the NJ Council on the Social Studies, who worked with Diane Castino, a former president of the NJ Council for the Social Studies, and a social studies teacher at the Lovell Honiss School in Dumont. The Bergen County Office of Cultural and Historic Affairs provided artwork and historic information through Janet Strom, line drawings were produced by retired Record artist Charles Mcgill and James Whitney a New Milford artist and school employee. 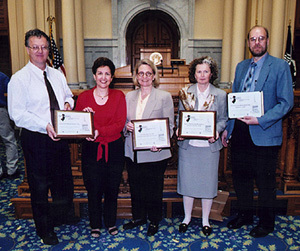 Recognition to the project team: Cynthia Forster of the Bergen Record; Diane Castino, Student Activity Writer, Lovell Honiss School; James Whitney, Artist and employee of the Lovell Honiss School. 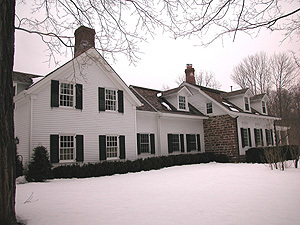 With its surrounding acreage, the Jacobus Vanderveer House is the last remaining site in Somerset County to have been associated with the locally prominent Vanderveer family. It is the only structure that remains intact from which to interpret the Vanderveer family and local Revolutionary War Activities. 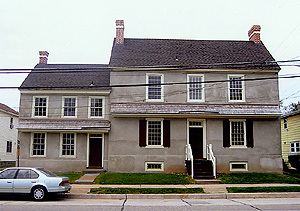 While the period of historical significance is 1772, when the building was first built, the house reached its architectural apex in 1813, immediately following Mary Hardenburgh Vanderveers’ Federal style additions. In its approach to interpretation, the rehabilitation of the Jacobus Vanderveer House is unique. While an important part of the significance of the house lies in the Vanderveer’s role in the Revolutionary War, architecturally the building’s significance lies in the evolution of its framing to its ca. 1813 appearance. By leaving both wings intact and treating them differently on the interior both aspects of the buildings significance - its architectural and historical importance - can be interpreted. The Vanderveer family and eighteenth century life will be interpreted in the period rooms of the ca. 1772 section. The Pluckemin Encampment and local participation in the Revolution will be represented in movable and permanent exhibits in the gallery spaces of the ca. 1813 section. On the interior, these zones of interpretation are clearly expressed in the different finish treatments and lighting while on the exterior, a single period - the building’s 1813 appearance is captured. The project scope was extensive, involving documentary research, selective demolition, careful investigation and analysis, restoration of existing finishes and reconstruction of missing elements. Currently, archeological investigation is being used to reconstruct the footprint of the original kitchen wing, which was built contemporaneously with the older section. The successful collaboration between the Township of Bedminster and the Friends organization is enabling the potential of this significant local and regional resource to be fully realized. Funding has been secured from Somerset County, NJ Historic Trust funds, and private donations. Thus far, the project has taken three (3) years and cost $629,000. Recognition to the project team: The Friends of the Jacobus Vanderveer House Trustees; Linda McTeague , Preservation Planning Consultant; The Township of Bedminster, Owner; Holt Morgan Russell Architects, PA; Hunter Research, Inc., Archaeology; Princeton Engineering Group, LLC; French & Parello Associates, P.A., Structural Engineer; Haverstick Borthwick Co., Inc.; Ludlow Heating & Cooling, Mechanical Contractor. Once established, the Foundation acquired the long-neglected and abused Wright House in August 2000. The Wright House was a rare, surviving example of 18th century housing in Salem City; it was located in a neighborhood with very few restored historic structures, but rich with such possibilities; the purchase price was just $25,000. Construction cost $391,388 and the house sold for $199,000 remarkably only six days after being placed on the market. The project was counted a great success even though it did not recoup its entire investment because it made a very prominent and visible impact upon the streetscape. Secondly, it generated a great deal of positive publicity for the city and was the focus for a number of preservation and history-focused programs. This absentee-owned tenement was turned into an owner occupied residence and a deed restriction was placed on the property to ensure its preservation into the future. The Salem Old House Foundation is a “grass roots” effort, capitalizing on local talent and determination. While this type of organization exists outside the state of NJ, this may be the first of its kind within. And it is hoped that this award will help to guarantee the Foundation’s future success as well as to inspire others to duplicate their methods. Encouraged by the success of the Wright House, the Foundation has already purchased another property and is well underway with creation of another rejuvenated and owner occupied residence. Additionally, the Abel and Mary Nicholson House National Historic Landmark in Elsinboro was recently donated to the Foundation along with seed funding for stabilization. The Foundation is embarking on developing this site as an educational resource. This is an impressive list of accomplishments in the few short years since the Foundation got underway in 2000. Recognition to the project team: Ronald E. Magill, President/Project Manager, Salem Old House Foundation, Carol Y. Reese, Executive Vice President, Salem Old House Foundation, John P. McCarthy, Vice President and Corporate Secretary, Salem Old House Foundation, Earl Urion, General Contractor. 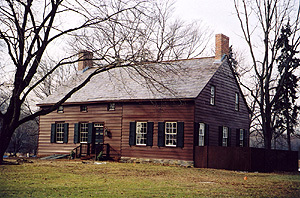 In 1997, Edward and Patricia DeSear purchased the Ackerman Dater House, built in 1745 by Johannes Ackerman, and which was included in the Thematic Nomination of Early Stone Houses of Bergen County, but time had taken its toll. The roof was shot, the built-in Yankee gutters and chimneys needed to be rebuilt, substantial insect damage was evident, and the walls had to be shored to replace damaged structural members. Soffits, fasciae, brackets and wood siding all had to be repaired and new materials made to match the old. Stucco repairs were needed. Extensive electrical re-wiring and new plumbing was added. A sensitive new wing was added to provide kitchen and living area and alleviate pressure from the historic interior spaces. The project took 18 months and cost $500,000. Rarely has the attention to preservation detail on a residential rehabilitation rivaled that of a museum property, without the coaxing of regulatory oversight or encouragement from grant funding. In such a densely developed part of our state, with competitive real estate values, this house could easily have been torn down or insensitively renovated. This property is once again a gem of Saddle River and efforts like this that go “above and beyond” are worthy of notice. One of the earliest buildings in the community was the Woodbine Brotherhood Synagogue, which was built in 1896 as a place for these new residents to meet and worship. The synagogue was a focal point of religious and social life for the local community. 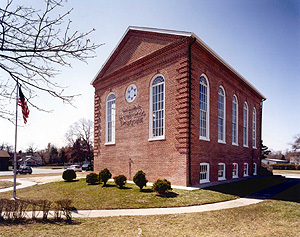 Religious services were held at the synagogue throughout the twentieth century. But it was after the Jewish population had dwindled to a point where there was no longer a congregation to support services, and the trustees were set to place the building up for sale, that Michael Azeez came forward. The NJ and National Register listed building underwent a major rehabilitation that included repointing, a new roof, new windows, re-glazed and restored existing windows, new wiring, new bathrooms, and a full conversion of the basement to use as museum space. The resulting museum exhibit has meaning for the community, both past and present. While portraying the history and heritage of the town, each exhibit panel raises a question in an effort to encourage people to think, and to see how the events and circumstances of the past relate to their lives today. This project took 2 years and cost $1,049,000. 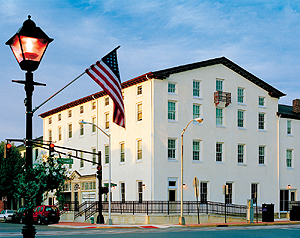 The building remains as a vibrant part of the community, interpreting a unique, but not widely known, facet of New Jersey’s history. The Hackensack Water Works, located on Van Buskirk Island, in Oradell Borough, was listed on Preservation New Jersey’s ten most endangered sites list in 1996. Since then, and through the tireless advocacy effort of the Water Works Conservancy, the site is still standing, but awaiting its rebirth. The written and pictorial documentation of this industrial resource has provided a catalyst for new thinking and all indications are that a preservation plan is underway. While the site’s owner, Bergen County had been less than enthusiastic about keeping this resource intact, this book has helped to shift momentum into a positive direction. The book is a wonderful “easy-to-understand history of the complex, as well as a nicely written explanation of the plant’s context within the phenomenal growth of northern New Jersey throughout the late-19th and early 20th centuries. 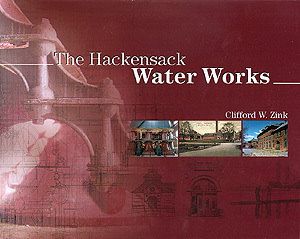 Mr. Zink’s analysis of the role the Hackensack Water Works played not only in the growth of Bergen County, but in the evolution of the water treatment, purification and pumping technologies for our nation throughout the last century casts the complex into a very favorable and convincing light for a future National Historic Landmark nomination. Mr. Zink’s book is well-illustrated, nicely captioned and thoughtfully laid out. In particular, I found that his oral histories provided an insight into the day-to-day activities of operating and maintaining the plant that is sorely deficient in most historic 20th-century industrial museums. Funding for this endeavor was made possible through a variety of private sources, as well as through substantial grant support from the NJ Historical Commission. The author of this book, Clifford Zink, is meticulous in his attention to historical detail, with a remarkable ability to bring an old building and its story back to life. He turned this endeavor into a labor of love and brought an inspiring level of insightful passion to this project. 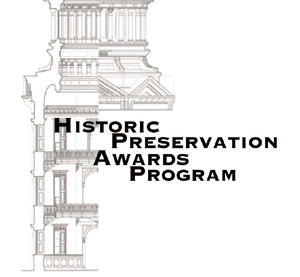 This award honors an individual for his lifelong dedication to the field of historic preservation. 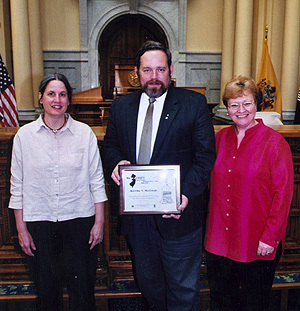 As advisor, author, county historian, commission member and company president, Wayne T. McCabe has spent more than 30 years of his professional life to advancing the appreciation and protection of New Jersey’s historic resources. Wayne earned his Master’s Degree in City and Regional Planning with a concentration in historic preservation and American architectural history from Rutgers University. One of Preservation NJ’s founding Board members, Wayne has continued his volunteer commitments throughout his career and continues to spend many hours as Sussex County historian giving slide presentations to groups such as seventh graders studying the Civil War and to residents of nursing homes. Professionally, Mr. McCabe is the president of McCabe & Associates, a cultural resource firm celebrating its 10th anniversary, offering a wide range of professional planning, engineering, land surveying, and historic preservation services and located in a late-nineteenth century house on Main Street in Newton. 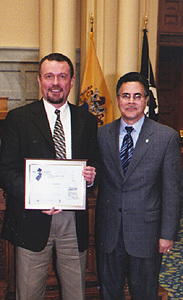 His practice knows no boundaries as he currently serves as the consultant to the Historic Preservation Commissions in the City of Burlington, Mount Holly, and Evesham Township in southern New Jersey; Bergen County’s Mahwah Township Historic Preservation Commission; and Essex County’s Montclair Township Historic Preservation Commission as well as in his hometown of Newton. 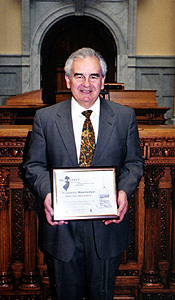 He has also prepared design and procedural guidelines booklets that are written in the concise language of a good interpreter who understands the complex language of the Municipal Land Use Laws, the Secretary of the Interior’s Standards for Rehabilitation, and local ordinances and who effectively translates them for a general audience. Wayne also became founding partner of Historic Preservation Alternatives, a small publishing company that produces paperback pictorials now with nine titles including A Penny A View: Albums of Postcard Views for Lafayette, Stillwater, Newton, Sparta, Ogdensburg, Franklin, as well as the Railroads of Sussex County and Building the Lackawanna Cutoff in Sussex and Warren Counties. They contain a perfect combination of pictures and text contributing to and expanding knowledge of local history within smaller rural communities that do not qualify to have Arcadia books published. The Victor Talking Machine Company and its successor, the Radio Corporation of America were among a few select industrial giants that played importantly in the rise of Camden in the last Century. The “Nipper Building” is one of only four remaining buildings from the once expansive Camden Plant of the RCA Victor Company. Originally constructed in 1909-1916, the Nipper Building was the birthplace of the “Victrola” and recorded sound from the origins of the Victor Talking Machine Co. founded in 1901. 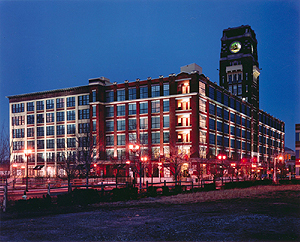 An intact and representative example of early twentieth century industrial architecture and a work of the important architectural and engineering firm of Ballinger & Perrot, the Nipper Building was one of the firm’s most famous commissions, and one that would contribute to their international reputation for industrial facility design. The building became vacant, vandalized and a blight to the surrounding waterfront after manufacturing ceased in 1992. 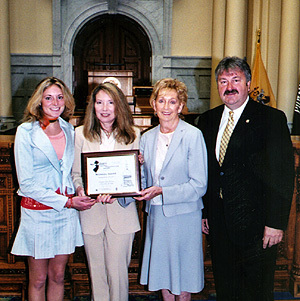 In 1997, the building was listed on Preservation New Jersey’s Ten Most Endangered sites list. Dranoff Properties, with a strong record of successful rehabilitations of historic sites stepped forward and took on the challenge of saving and rehabilitating the complex. Utilizing the Investment Tax Credit, this 632,000 square foot structure was converted into a complex that features a mix of 341 one, two and three bedroom upscale loft apartments - complete with incredible views of the Philadelphia skyline, a 24 hour four star quality lobby with concierge, an exclusive 3 story rooftop fitness center, a well appointed club room, conference/media centers, a magnificently landscaped atrium featuring furnished terraces and decks and finally 25,000 square feet of on-site retail to serve both tenants and the surrounding community. The restoration was completed in August of 2003 at a cost of $65 million. Most importantly, this project represents the largest private investment in market rate housing in Camden in over 40 years. Because of this project, a stronger neighborhood is emerging with new market-rate housing. In developing this site, Dranoff overcame the City of Camden’s negative stigma by approaching the project with the attention to detail and by delivering a compelling “best in market” product. Approximately 80% of the project’s funding came from private sources, namely through Dranoff Properties, Fleet Bank and Related Capital. Remaining funding came from various public sources including the Casino Reinvestment Development Authority, the NJ Redevelopment Authority and the Delaware River Port Authority. This project represents an incredible vision and the final product is absolutely breathtaking; a testament to realizing the potential of every urban setting in NJ. Recognition to the project team: Dranoff Properties, Developer; Powers & Co., Inc. Historic Preservation Consultants; Bower Lewis Thrower, Architect; INTECH, General Contractor; Keast and Hood, Structural Engineers.